European Defense: Back to Tervuren? For years the European Union has struggled to give more coherence to its institutions. Despite the recent economic recovery, these institutions have remained imperfect. They have proved incapable of responding adequately to the refugee crisis, to the rise of populism and nationalism in many EU’s member states, to terrorism, and to Russia’s provocations to name just a few of the challenges that Brussels faces today. Brexit presents another issue for the EU. EU negotiations with the British government are mostly focused on the free movement of people, and Britain’s extrication from the common market. Yet, despite all those challenges, with Brexit on the table, and the Trump administration in the White House, the EU seems to be moving toward more cooperation and coordination in military affairs. 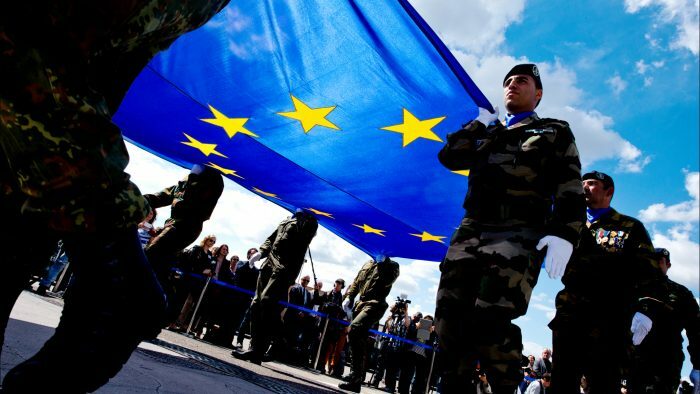 Opinions are split when it comes to the question of whether or not the EU can be successful in its attempts to achieve more military coordination, and, by the same token, more cooperation. Menon claims that there is “no reason to assume that Brexit offers any real opportunity for an effective relaunch” of Common Security and Defense Policy (CSDP) (Menon, 2017). A 2017 RAND report makes a similar point (Black, et al., 2017)[i]. Also, Simón claims that neither Brexit, nor Donald Trump will have any significant impact on EU defense (Simon, 2017). Yet, other analysts are prudently optimistic. Angelini argues that: “the possible revitalization of the CSDP following Brexit will depend on the political appetite for such a path among the remaining EU member states – in particular France and Germany” (Angelini, 2016). Nye attributes a potential revival of a European common defense structure to the Trump administration policies (Nye, 2017). This article argues that Brexit, and, the Trump administration’s position toward Europe gives the European Union a new opportunity to relaunch the project of deepening its military coordination. This is not the first time the European Union has had such an opportunity. The 1998 Saint-Malo initiative was an important moment in European defense. At Saint-Malo, Great Britain, France, and Germany came together to support the creation of an autonomous military arm for Europe. However, in spite of the military developments that followed Saint-Malo, the EU’s defense has remained clearly dependent on the U.S. An interesting and mostly overlooked moment in the development of the European Defense came in 2003 at the Tervuren summit which was triggered by America’s war on Iraq. At Tervuren, France and Germany notably came together and tried to launch a military arm for Europe. Great Britain, backed by Washington, vetoed their efforts. Today, with Great Britain entangled in Brexit, and the Trump administration’s wavering commitment to Europe’s defense, a new Tervuren moment has arrived. The EU has a new opportunity to relaunch its military coordination and create a stronger defense for itself. It has the opportunity to work towards the Tervuren goals: a more coordinated and integrated military defense. After the Cold War, the most important development in European security was the 1998 Saint Malo Initiative. The experience of the Kosovo war led directly to the Anglo-French Saint Malo proposal to establish a European Security and Defense Policy. Saint Malo emphasized that the EU must be able to act without U.S. involvement, and it affirmed the creation of an operational European defense capability (Cameron, 2002). The initiative led to the establishment of the European Rapid Reaction Force which was tasked with crisis management operations. Yet, the EU’s dependency on the US in matters of defense has remained. However, just as Kosovo led to Saint Malo, the beginning of the Iraq war led to the 2003 Tervuren summit. In 2003 disagreements were brewing among EU member states over the Iraq invasion. Discontent with the US action was notably expressed by France and Germany, and, by most accounts, the transatlantic relationship was in trouble. The Tervuren summit took place on April 29, 2003, when the governments of France, Germany, Belgium and Luxembourg came together in an effort to give Europe an autonomous military arm. French President Jacques Chirac, German Chancellor Gerhard Schröder, and the leaders of Belgium and Luxembourg pushed for EU military planning and command structures, separate and independent from the US-led NATO alliance. They wanted treaty provisions for “structured cooperation” on defense, which would have allowed a small group of EU nations to forge ahead with military integration, regardless of other member states’ opinions (Islam, 2003). Chirac insisted that the proposal to create a military center in Belgium for “planning and command” of joint European operations outside NATO was not “about duplicating SHAPE” (Supreme Headquarters Allied Powers Europe) but rather was about “eliminating duplications by national headquarters” (cited by Sciolino, 2003). Rather like Frankenstein’s monster, the Franco-German relationship has a habit of appearing dead for long periods, only to spring life and start crashing around once more … In March, they [Chirac and Schröder] put forward joint plans (with Belgium and Luxembourg) to set up a European defense headquarters separate from NATO (The Economist, 2003). In the end Tervuren did not amount to too much, although, eventually, a European Union Military Staff (EUMS) was created. EUMS was charged with strategic planning for the Petersberg tasks. The Petersberg tasks include operations such as: humanitarian and rescue tasks; peacekeeping tasks; tasks of combat forces in crisis management, including peacemaking (II.4) (WEU Council of Ministers, 1992, p. 4). Recently, we have come to a new Tervuren moment. Because of Brexit, and the Trump administration’s ambiguous commitment to NATO’s Article 5,[ii] there are new military developments indicating that several EU member states, particularly Germany and France, want “more defense.” Today, Angela Merkel’s words echo those of her predecessor: “We have to know that we must fight for our future on our own, for our destiny as Europeans” (Smale & Erlanger, 2017) The German Chancellor is not shy in voicing her disappointment with President Trump’s stance on Europe: “The times in which we could rely fully on others — they are somewhat over.” (Smale & Erlanger, 2017). Those statements illustrate Merkel’s determination to make increasingly active choices on EU military structures, particularly following an era of German defense spending cuts aimed at reducing the German troop numbers to about 180,000 soldiers (DW.com, 2010). Echoing Chancellor Merkel, the German Defense Minister, Ursula von der Leyen stated that “The Brexit referendum and the U.S. election opened our eyes. Europeans must take more responsibility for our own security” (Reuters, 2017). Referring to Brexit, one other German official voiced his optimism that concrete EU defense efforts could proceed without worrying about a UK veto: “It is a sign to the British. It means ‘you are leaving the EU and we are driving forward. We are no longer interested in you blocking the EU on defense” (The Telegraph, 2017). Von der Leyen has been at the forefront of increasing the readiness of Germany’s armed forces. She has also been a strong advocate for augmenting Germany’s defense spending “in response to growing global instability” (Reuters, 2015). Germany’s present efforts have been joined by French President Emmanuel Macron, and the two countries are working out specific proposals for a European Union defense fund. Together they have proposed: joint work on drones, military transports, and stabilization initiatives supported by the defense fund (Reuters, 2017). Furthermore, as reported by Süddeutsche Zeitung, the cooperation between the French and German governments extends to previously off-limits projects: “the establishment of European defense headquarters, a common satellite surveillance system, and the sharing of logistics and military medical resources” (The Guardian, 2016). The creation of a European defense HQ – which was one of the main demands at Tervuren – has always been a contentious topic. The US and Great Britain feared that a defense EU HQ would create a parallel structure that would rival NATO, and damage the transatlantic security relationship. However, recently, with Britain’s exit from the European Union, the context in which the discussion about the proposal is taking place has changed drastically (Kanter, 2017). On July 13 2017 there was another important development “France and Germany unveiled plans to develop a European fighter jet, burying past rivalries as part of a raft of measures to tighten defense and security cooperation. This move is expected to shape the future of the European fighter industry and its three existing programs – the Eurofighter, France’s Rafale and Sweden’s Gripen” (Hepher & Thomas, 2017). French President Macron is also taking aim at competing standards within the European Union that impede collective defense efforts and have the effect of creating wasteful competition between member states. Earlier in 2017, Germany, Romania, and the Czech Republic announced the integration of parts of their militaries (Braw, 2017). They followed the example of parts of the Dutch military—one brigade joining Germany’s Rapid Response Forces, and another one being integrated into the 1st German Armored Division. Those moves represent a new trend in standardizing and integrating Europe’s armed forces. The European Commission also entered the fight. It announced the creation of “a fund with at least 1.5 billion euros a year to enable EU governments to join forces on development and procurement of new weapons, including drones, cyber warfare systems and other hi-tech gear” (Reuters, 2017). In the emerging fields of ‘Warfare 2.0’ such as cyberwarfare and drones, the European Union, uncontestably, sees an opportunity to establish itself as a collective actor. What do these developments amount to? According to Carlo Masala, professor of international politics at the Bundeswehr University Munich, they amount to a “move towards more European military independence” (cited by Braw, 2017). To speak of EU military independence is premature. The German-French proposal is aimed at making the European defense “more active and more useful without substituting it for national defense bodies which remain, by definition, the key to the security of EU member states” (The Guardian, 2016). Undoubtedly, Europe is taking steps toward more military coordination and cooperation. Those steps may not be giant, but one should not forget that the European Union’s advancement has been always predicated on small steps. Europe would have never had a CSDP (renamed today CSDP) if were it not for the Maastricht Treaty. Negotiations on the creation of a Common Foreign and Security Policy (CFSP) at Maastricht were marginal compared with the negotiations on EURO. In any case, those negotiations opened the door for more coordinated actions on Europe’s foreign policy, as well as for military coordination. Today’s Tervuren moment should not be wasted, if the EU wants to contribute more to its defense, and to become a more powerful actor at the international level. Academic honesty requires acknowledging possible factors that can generally weaken processes. The new Tervuren momentum aimed at bringing more coordination to Europe’s military could be delayed or even derailed by several factors. In order for the process to continue: (1) Angela Merkel needs to overcome the resistance of a large segment of German population to be able to increase armament expenditure; (2) French President Emmanuel Macron needs to reboot France’s economy; (3) After Macron’s election, Angela Merkel stated that: “we are ready to activate Franco-German relations with a new impetus” (The Telegraph, 2017).In the light of her statement the activation of the Franco-German axis needs to hold and, (4) EU states should be willing to spend more on their defense. On a different note, when it comes to geopolitics, scholars tend to focus on the threat posed by Russia to Europe. It is important to note that not all EU member states perceive Russia as a conventional military threat. The Baltic States see a possible Russian invasion as the main threat to their security. However, Europe’s southern rim, Greece, Italy, and even Spain, is struggling with an increasing flux of refugees. For those countries, Russia does not represent a conventional military threat. A RAND report from 2017 states that “Perceptions of Russia as a Military Threat Differ Sharply Across Europe and Appear to be Heavily Influenced by Geographical Proximity to Russia” (Pezard et al., 2017). Similarly, one could argue that Russia does not present a military threat for Germany and France either. Germany has the North-Stream, a set of pipelines which carry natural gas from the Russian Federation to Germany. Therefore Berlin’s reasons to antagonize Russia militarily are very low. Moreover, Germany has only reluctantly agreed to the renewal of sanctions against Russia. However, France and Germany are aware of the cyberthreats coming from Russia and they are in the process of developing stronger cyberdefense (Nossiter, Sanger & Perlroth, 2017). Some Central European states such as Hungary show clear signs of friendship toward Russia (Janda et al., 2017). Russia may be at the core of NATO’s exercises, but it is not the main reasons for which the EU is trying to create more military cooperation. The main reasons for which the German-Franco axis is pressing with more integration are similar to the reasons expressed at Tervuren: a EU less militarily dependent on the US and increased EU influence in the international arena. [i] However, the same RAND report outlines a scenario in which Brexit may/will negatively impact on European security as well as a scenario in which European security may be enhanced. [ii] Despite Trump’s reaffirmation of NATO Article 5 in Warsaw, ambiguity remains with regards to his stance on NATO and his policy toward Europe overall. Patrick Wintour argues that “Trump has little option but to take a tough line with Putin” and commit himself to Article 5 (Wintour, 2017). Angelini, L., 2016. Brexit is an opportunity for EU defence policy. [Online] EU Observer. Available at: https://euobserver.com/opinion/134256 [Accessed 26 June 2017]. Black, I., 2003. Nato bid to defuse EU defence row. [Online] The Guardian. Available at: https://www.theguardian.com/world/2003/oct/21/nato.politics [Accessed 14 August 2017]. Black, J. et al., 2017. Defence and security after Brexit: Understanding the possible implications of the UK’s decision to leave the EU — Compendium report. [Online] RAND Corporation. Available at: https://www.rand.org/pubs/research_reports/RR1786.html [Accessed 30 June 2017]. Braw, E., 2017. Germany Is Quietly Building a European Army Under Its Command. [Online] Foreign Policy. Available at: http://foreignpolicy.com/2017/05/22/germany-is-quietly-building-a-european-army-under-its-command/ [Accessed 24 July 2017]. Cameron, F., 2002. Ten years CFSP: Closing the capability – Expectations gap. [Online] EURACTIV. Available at: https://www.euractiv.com/section/security/opinion/ten-years-cfsp-closing-the-capability-expectations-gap/ [Accessed 31 July 2017]. DW.com, 2010. Military commission recommends cuts at German Defense Ministry. [Online] Available at: http://www.dw.com/en/military-commission-recommends-cuts-at-german-defense-ministry/a-6151848 [Accessed 31 July 2017]. Hepher, T. & Thomas, L., 2017. France and Germany to develop new European fighter jet. [Online] Reuters. Available at: https://www.reuters.com/article/us-france-germany-defence-idUSKBN19Y1FJ [Accessed 14 July 2017]. Islam, S., 2003. Whither NATO? European Defense Force May Counterbalance US Power. [Online] YaleGlobal. Available at: http://yaleglobal.yale.edu/content/whither-nato-european-defense-force-may-counterbalance-us-power [Accessed 31 July 2017]. Kanter, J., 2017. E.U. Moves to Create Military Training Headquarters. [Online] The New York Times. Available at: https://www.nytimes.com/2017/03/06/world/europe/eu-military-headquarters.html?_r=0 [Accessed 29 June 2017]. Menon, A., 2017. Security and the Brexit Effect. [Online] E-International Relations. Available at: https://www.e-ir.info/2017/01/17/security-and-the-brexit-effect/ [Accessed 19 July 2017]. Nossiter, A., Sanger, D. & Perlroth, N., 2017. Hackers Came, but the French Were Prepared. [Online] The New York Times. Available at: https://www.nytimes.com/2017/05/09/world/europe/hackers-came-but-the-french-were-prepared.html?_r=0 [Accessed 20 August 2017]. Nye, J., 2017. Trump’s Gift to Europe. [Online] Project Syndicate. Available at: https://www.project-syndicate.org/commentary/trump-spurs-european-defense-integration-by-joseph-s–nye-2017-07 [Accessed 20 July 2017]. Ojanen, H., 2005. NATO and ESDP: old-style alliance meets a new Europe. [Online] Young Europeans for Security. Available at: http://www.yes-dk.dk/YES/index.php?option=content&task=view&id=107&Itemid=137 [Accessed 18 August 2017]. Pezard, S. et al., 2017. European Relations with Russia: Threat Perceptions, Responses, and Strategies in the Wake of the Ukrainian Crisis. [Online] RAND Corporation. Available at: https://www.rand.org/pubs/research_reports/RR1579.html [Accessed 20 August 2017]. Reuters, 2015. Germany to boost mid-term defense spending. [Online] Available at: https://www.reuters.com/article/us-germany-defence-budget-idUSKBN0MD1T420150317 [Accessed 24 July 2017]. Reuters, 2017. Germany, France drafting details of defense fund: German minister. [Online] Available at: http://www.reuters.com/article/us-eu-defence-germany-france-idUSKBN1910H4 [Accessed 3 July 2017]. Sciolino, E., 2003. Aftereffects: NATO; 4-Nation Plan For Defense Of Europe. [Online] The New York Times. Available at: http://www.nytimes.com/2003/04/30/world/aftereffects-nato-4-nation-plan-for-defense-of-europe.html?rref=collection%2Fbyline%2Felaine-sciolino&action=click&contentCollection=undefined&region=stream&module=stream_unit&version=search&contentPlacement=6&pgtype=collection [Accessed 31 July 2017]. Simon, L., 2017. Don’t Believe the Hype About European Defense. [Online] War on the Rocks. Available at: https://warontherocks.com/2017/06/dont-believe-the-hype-about-european-defense/ [Accessed 18 July 2017]. Smale, A. & Erlanger, S., 2017. Merkel, After Discordant G-7 Meeting, Is Looking Past Trump. [Online] The New York Times. Available at: https://www.nytimes.com/2017/05/28/world/europe/angela-merkel-trump-alliances-g7-leaders.html?_r=0 [Accessed 13 July 2017]. The Economist, 2003. The Franco-German monster. [Online] Available at: http://www.economist.com/node/2155461 [Accessed 12 August 2017]. The Guardian, 2016. Post-Brexit vote, France and Germany plan ‘more active’ EU defence. [Online] Available at: https://www.theguardian.com/world/2016/sep/10/france-and-germany-plan-more-active-european-union-defence [Accessed 16 July 2017]. The Telegraph, 2017. France and Germany announce plans to build fighter jets together. [Online] Available at: http://www.telegraph.co.uk/news/2017/07/13/emmanuel-macron-demands-germany-gives-cash-europe/ [Accessed 31 July 2017]. WEU Council of Ministers, 1992. Western European Council of Ministers Petersberg Declaration. [Online] Available at: http://www.bits.de/NRANEU/docs/petersberg92.pdf [Accessed 18 August 2017]. Wintour, P., 2017. Trump to meet Putin for first time after accusing Russia of testing west’s will. [Online] The Guardian. Available at: https://www.theguardian.com/us-news/2017/jul/07/trump-putin-russia-g20-hamburg [Accessed 8 July 2017]. Dr. Gabriela Marin Thornton is an instructional associate professor of international affairs at the Bush School of Government and Public Service at Texas A&M University (http://bush.tamu.edu/faculty/gthornton/). Her work has been published in International Politics, Perspectives on European Policy and Society, and The Washington Post. Tobias Oder is a graduate student in international affairs at Texas A&M University and specializes in U.S. grand strategy, international security, and transatlantic relations.